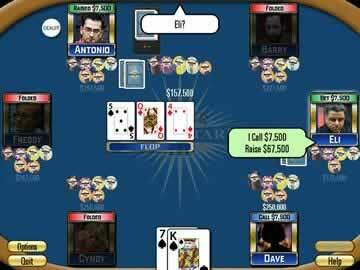 Poker Superstars III Game Review - Download and Play Free Version! Take on New Superstars and Improve Your Texas Hold Em Skills! You can speed up the game for fast paced poker action. Play against any of 12 poker superstars like Todd Brunson or Jennifer Tilly. Challenge mode is a good way to test your skill. Only offering Texas Hold 'em to play can get boring. Based on the hit television show, Poker Superstars III: Gold Chip Challenge raises the stakes with famous opponents and new ways to play Texas Hold 'Em, everyone's favorite card game! Grab a seat at the table across from pros like Barry Greenstein, Mimi Tran, Freddy Deeb, and Cyndy Violette - 15 in all. You really get a sense of playing with the best, but at the same time the game is winnable no matter what your skill level is! Everyone is gunning for that top spot - can you stand the heat ? 4 Ways to Play One of the World's Most Popular Card Games! Poker Superstars III comes with no less than four unique game modes for your enjoyment. Single Round mode is great for a quick game - each player starts with $250,000, and the last one standing is the winner! Limit Play makes for a longer session, since limits are placed on the amount you can bet and raise. Season Play mode lets you play out a whole tournament season, just like the real thing. Who knew there were so many ways to play poker!? Play the brand-new Challenges mode, for a unique challenge! The fourth game mode in Poker Superstars III gives you something most poker games don't. In Challenges mode, play through 12 fun and exciting scenarios with specific set-ups and objectives. Start with suited pairs and win $400,000, eliminate at least 2 players, win $300,000 with the ability to see another player's hole cards - the scenarios will test every area of your poker game! The Computer Players Give You a Run For Your Money! Sure, you might say, Poker Superstars III has some big names, but can they really back it up at the table when the chips are down? Well, we're here to tell you that the game's artificial intelligence is just that - intelligent. The other players will learn from your playing style, teaching themselves how to beat you. Still, Poker Superstars III is great for inexperienced players and even beginners, because it's got two difficulty levels and an optional game tips that suggests the best move in any particular situation. 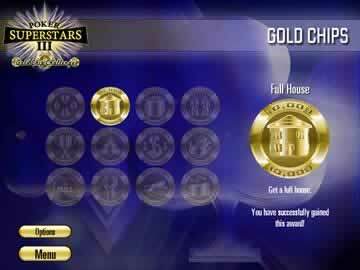 Win special gold poker chips for outstanding achievements! Get ten hands of pocket aces to earn the "Frequent Flier" achievement. Win a pot worth at least $1,000,000 for the "Big Pot" award. Double Knock-out, 5 Hand Streak, Major Earnings and more! There's lots of stuff to do, so collect them all to become a complete Poker Superstar! Poker Superstars III also tracks all your winnings, best hands, percentage of pots won, and percentage of flops seen so that you can review and improve your game. Poker Superstars III gives you a total poker experience, just like the television show. Think we're bluffing? Give it a try and find out! For in-depth Texas Hold 'em action there are not many games better than Poker Superstars III. You will be able to face off against some of pokers biggest superstars in tournament style play or single games. You can try beating all the challenges or earning all the awards for certain hands or eliminating players. With four modes of play and a variety of players to compete against you will get all the Texas Hold 'em action you can handle. In Poker Superstars III you have a profile that will keep track of all your stats like best hand, biggest pot, hands won and that sort of thing. There are four ways to play in this game: Season Play, Limit Play, Challenges and Single Round. Season play has you play several qualifying rounds against five other opponents. The better you do in these rounds the more chips you will start with in the semifinals. Having a bigger chip pile is an advantage. Limit play puts very specific limits on how much you can bet and raise. This forces players to raise back and forth for some time to increase the pot very much. An example would be having a maximum raise of $1,000, which means that at most you can raise the current bid by $1,000. These games typically take longer than usual games. The challenges give you specific scenarios to play, such as Nicknames, which gives you 12 hands that all have nicknames, and you must earn at least $300,000 playing these twelve hands to complete the challenge. Single Round lets you play a single game of Texas Hold 'em with the usual rules. In all these modes you can set the difficulty to either amateur or professional. With only two difficulty settings there is not much variability in how challenging the game is. Being able to play against the poker superstars like Todd Brunson and Jennifer Tilly makes this a unique game. The computer will play based on the represented individual's style of play. An example would be an aggressive player that raises constantly or a bluffer who is good at making you think they have a hand they don't. If you are a poker fanatic this is a great way to improve your skills. The graphics are fairly standard for a poker style game. The games are played on a table and a picture representing the other players is placed next to their cards. There is no animation other than cards dealing. If you are looking for a game that has a lot of animation for your opponents, this game might not be for you. If you just like to play poker then this game brings you straight poker action without all the frills. Sound is also fairly limited: a dealer will announce, when you bet chips will make noise and the cards make noise when they are dealt. The sound and graphics don't do anything to add to the game, but they do a great job of making a pure poker game. There is only one factor that limits this game: only offering Texas Hold 'em can become boring. The game has several ways to play, but you can still only play the one game. The addition of some extra forms of poker really would have made this a great game. If playing against some of the legends of poker is a dream of yours then it doesn't get much closer than this without sitting at a table with them. Several different modes of Texas Hold 'em give the game some variety that it lacks in different poker games. The simplistic style does a good job of bringing you a poker game without all the frills of other games. With variable difficulty poker players of any age and skill level can play this great game. If you are a Texas Hold 'em fanatic or just want to learn the game Poker Superstars III is a great choice.